Andy and I were just confirmed to conduct a workshop on graphing, calculating, and interpreting rate of improvement in June 2013! Our state technical assistance network is hosting an implementers forum to have school-based RtI teams within the state come together for professional development. We’re looking forward to presenting to a mixed group of professionals! Andy McCrea and I are presenting next month in Philadelphia for the National Association of School Psychologists Annual Convention. We are hoping to have an informative and interactive session with our participants. To sign up visit http://www.nasponline.org/conventions/2012/workshops.aspx and click on WS36. All participants are strongly encouraged to bring a laptop or tablet with Excel or Numbers!!! Our workshop can be attended as “Part II” to Dr. Joe Kovaleski’s workshop WS31. Our workshop on Thursday, February 23, 2012, 12:30-3:30PM. Andy and I review the research on interpreting student growth using curriculum-based measurement data, model how to use Excel or Numbers to calculate a rate of improvement statistic, and discuss how student growth fits into the eligibility conversation within an RTI model. Data analysis and graphing will be featured. Participants are strongly encouraged to bring a laptop or tablet computer equipped with Excel or Numbers. 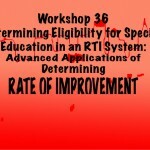 This workshop can stand alone or serve as Part II to Dr. Kovaleski’s introductory workshop entitled Determining Eligibility for Special Education in an RTI System: Basic Concepts and Procedures (WS31), Thursday, February 23, 2012, 8:30–11:30 a.m.
Bring a colleague! Hope to see you there!